As you can see, no dupes here. They do actually look more different in real life believe it or not. Smooth Sailing almost looks purple next to Skylar which is a dusty slate blue while Smooth Sailing is very periwinkle. Besides the base colours which are very different, the shimmer is also different. Smooth Sailing has a silver shimmer (in some lights you see little hints of pink and blue too) and Skylars shimmer is almost a mixture of silver and gold. I think Skylars shimmer is more noticable. Both colours apply super well. This is two coats of each. Anyway, Since I still was feeeling the gradient trend I decided to do a colour gradient instead. I used two coats of Color Club Shabby Drab (3 on some fingers) and then a cosmetic sponge to place Neeka at the tips. I'm really loving this mani! Hi guys, I know this is really belated, but I have really super quick swatches of the Essie Luxeffects collection. I'm sorry I haven't had time to swatch on my hands, but I thought I'd show you anyway aha. I love this collection mainly because it's so unlike Essie! 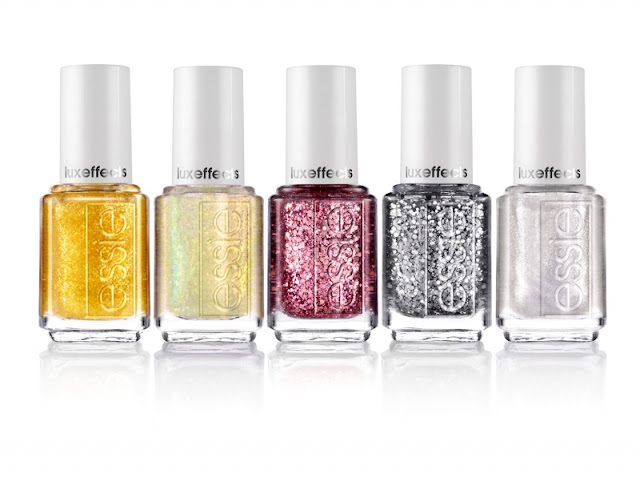 Essie are so bland to me, so many pinks, so many beige's, so many browns *yawns* but this is a really fun collection. Props to Essie, They did a REALLY great job with this collection! Hi guys! Since i've been camping for the last few days and haven't done any NOTD's I thought I'd do a bit of a comparison for you, between LUSH Lemony Flutter & Burt's Bees Cuticle Cream. Check out my in depth review after the jump!